Written by: Chris Givens on June 4, 2015. I am not a morning person. Often, rising from bed seems like harder work than any experiment I will do in the coming day. Coffee helps, but my morning shower is what gets me going. While practicing my hygiene regimen, my sleepy mind awakens. Unconsciously, I corral my scattered thoughts and focus on one subject, thinking deeply for the ten or so minutes of my shower. 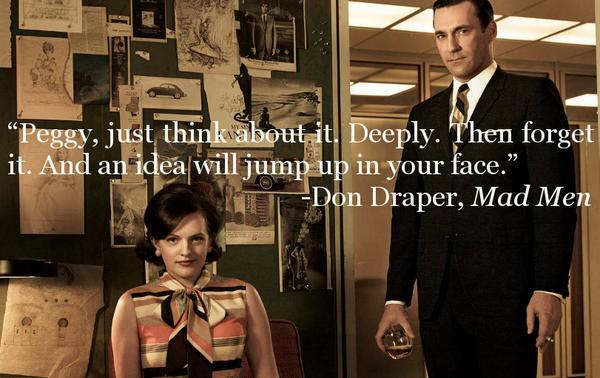 Frequently, I simply find new meaning in last night’s episode of Mad Men or a favorite Fleet Foxes song. However, I occasionally find new ways to approach experiments that have been stumping me, or a new facet to my research that demands further investigation. I exit the shower energized by my one or two minor epiphanies conceived as a byproduct of keeping my body in good order. This phenomenon is not uncommon- I have heard my parents, my friends, and my colleagues all mention that they came up with an interesting idea in the shower. But what about the shower causes such creativity? It may all be due to the behavioral principle of incubation. During intense periods of problem solving or other creative work, artists or scientists frequently run into a wall, where, try as they might, they just can’t find the right word or make sense of their data. The creative in question is a victim of mental fixation. This happens when bad habits and fruitless lines of thought build a thicket in the mind, blocking passage to productive lines of thought. Overcoming creative blockages is no small feat. Behavioral research shows, however, that a prudent way to fresh creativity is to forget about the task at hand and let the subject incubate. The incubation period could be short, ranging from minutes to hours, or longer, such as a night’s worth of sleep or perhaps days. Incubation periods help break through mental barriers to creativity. During these periods, unproductive fixations relax and perspectives shift, clearing the thicket and allowing new ideas to spring into a rejuvenated mind. The reason that incubation works is still a mystery. Some research suggests that simply ceasing conscious effort causes the aforementioned mental relaxation, followed by more freely flowing ideas. Others contend that in the absence of conscious effort, the unconscious mind works on the problem in the background, readying new ideas for when the brain begins thinking about the problem again later. Interestingly, the effects of incubation intensify while engaging in easy tasks dissimilar to the one at hand. For example, a stumped writer might play video games for an hour to clear their mind (I’ve definitely never done this). Whatever the workings behind incubation are, it seems that insights from shower thinking are no fluke. As for the writing of this article, an episode of Mad Men may have helped more than I realized. This entry was posted in Blog and tagged Everyday Questions, Personal Hygiene, Psychology, Weird Science by Chris Givens. Bookmark the permalink.